Prof. Sergio Rigoletto has published an essay titled ‘Against the Telelological Preseumption: Notes on Queer Visibility in Contemporary Italian Film’ in The Italianist 37: 2, 2017. The essay is concerned with some of the problems involved in the task of narrating the queer self. At a time in which positive queer representations have become increasingly common in Italian cinema and other media, it is worth asking what conditions underpin the present regime of queer visibility and what alternative queer experiences have been either obscured or marginalized. The first half of the essay explores the recent popularity of the coming out narrative in the Italian context. The essay asks what epistemological assumptions underlie the metaphor of coming out and how such assumptions have come to affect the terms under which queerness appears now visible in Italian cinema and other media. The second section of the essay focuses on several recent Italian documentaries including La bocca del lupo (Marcello: 2009), Felice chi è diverso (Amelio: 2013) and Le coccinelle. Sceneggiata transessuale (Pirelli: 2011). The essay shows the complex ways in which these films deploy their dissident strategies of queer self-revelation and configurations of social legibility. 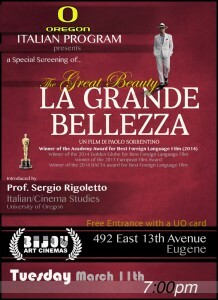 The UO Italian Program presents a special screening of ‘La Grande Bellezza‘, un film di Paolo Sorrentino. Winner of the 2014 Academy Award for Best Foreign Language Film! 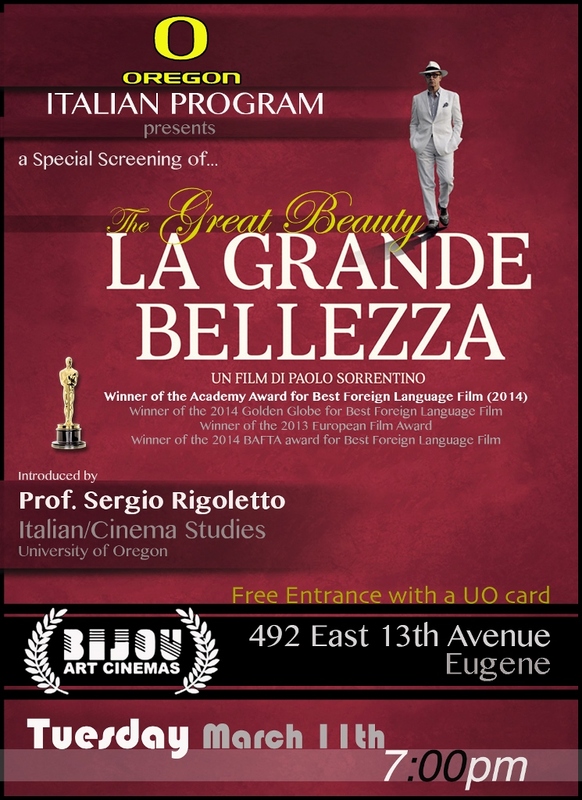 The film will be introduced by Sergio Rigoletto, UO professor of Italian/Cinema Studies. 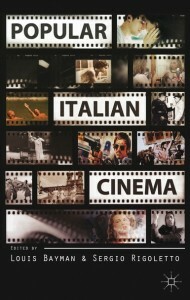 Assistant Professor of Italian and Cinema Studies Sergio Rigoletto has published a co-edited volume entitled Popular Italian Cinema (Palgrave Macmillan). The collection includes two essays by Prof. Rigoletto: “The Fair and the Museum: Framing the Popular’ (co-written with L. Bayman) [Open Access Postprint] and “Laughter and the Popular in Lina Wertmüller’s The Seduction of Mimì” [Open Access Postprint]. Prof. Rigoletto has also published an essay, “Contesting National Memory: Masculine Dilemmas and Oedipal Scenarios in Bernardo Bertolucci’s Strategia del ragno and Il conformist” [Ingenta] [Open Access] in Italian Studies. The essay is a reading of the theme of the oedipal conflict between father and son in these two films as an exploration of the problematic relation between Italy’s post-1968 and its fascist past. 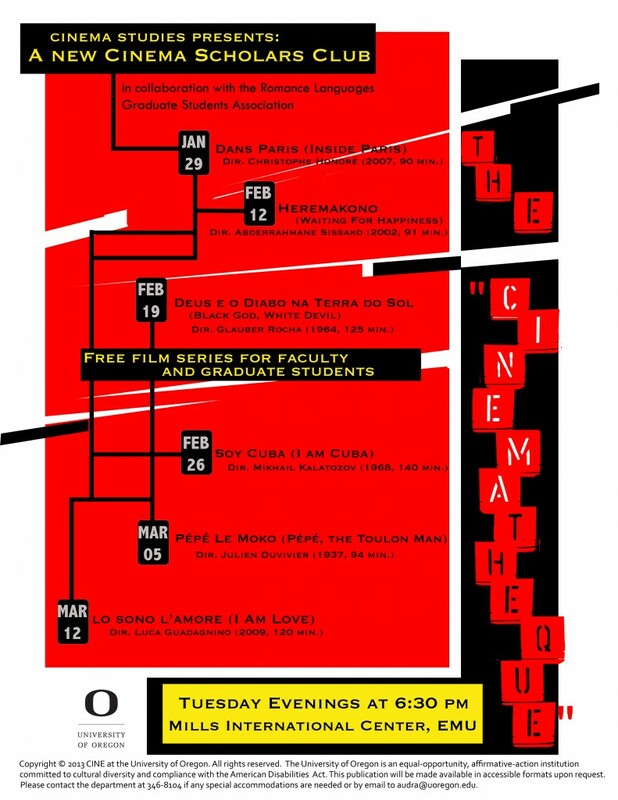 Cinema Studies presents The Cinematheque, a new cinema scholars club. Films are shown Tuesday evenings at 6:30pm in the Mills International Center. The first film screening takes place on Tuesday January 29th: Dans Paris (Dir. Chirstophe, 2007, 90 min). All film screenings are free for faculty and graduate students.